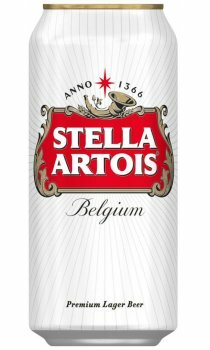 Stella Artois is renowned as a quality beer brewed for an average of 6-11 days longer than most other beers using the finest quality hops and barley including Bohemian Saas hops. It is these Saas hops that give Stella its distinctive full flavour. The perfect pint of Stella should be served at 6-8 degrees centigrade to ensure the full flavour of the beer. Brewed in the UK under license. Yes, it's what you'd expect from that great belgian brewery in Magor, just off the M4 in Wales! Famous for being drunk by chavs and lager louts. Put all the 'big' UK 5% 'premium' brands up against each other in blind taste testing and which ones consistently comes out bottom? Stella. It is a poor pint, but masters of marketing. Grolsch, Kronenbourg, Heineken, Stella... don't bother moving past Kronenbourg. I have through my younger years and tried many different lagers most turned out to be pretenders to the real macoy. Many say Stella gives them a thick head following a session, I say Hey! don't mess with the Best, stick to the pretenders. When your'e young as long as there is xxxx%vol on the side of a can you will drink almost anything, and as you age you tune and hone your tastes of beer. After years of searching, tasting and consuming large quantities of beer one stands out as a clear favourite. Stella Artois, in my peronsal opintion, is the finest and best beer ever brewed. It has a crisp and clear taste (but plesant crispness, unlike say a Budcwiser or Carlsberg export or special brew), and has the quality you would expect from any Belgian brewery. I love stella artois, and is always my preferred beer wherever in the world.